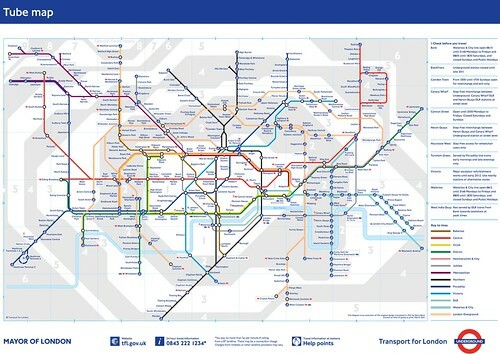 What's wrong with the new Tube Map? TfL put a new London Underground map on their site today to take account of the new Dalston/Highbury & Islington extension on the London Overground. In their excitement they made a mistake which Peter spotted. See if you can discover what it is before they correct it (Clue - it's in the section I've linked to above) hopefully it's not made it to the new printed versions out tomorrow! No prizes, just the satisfaction of knowing you're right! Update - Just had an email from the press desk of LU who said "Thanks for tip re map mistake, now resolved. Fortunately supplier error didn't make its way on to hard copy poster and pocket maps ..."
If my commute this morning was anything to go by, Baby on Board badges should be day-glo, about a six inches wide and also have flashing lights on them. I was pretty shocked to see a whole section of people on my train this morning ignoring a woman wearing a badge quite prominently. When she and I both got on at Hammersmith, the train wasn't completely packed but there were no seats & in my section of the carriage there was only me & her standing. Ah, I thought, here's a perfect example of how the badge will work. She wasn't really one of those border line cases where you think "Fat or Pregnant?". She didn't really look pregnant. I guessed she as at the early stages of her term. Great, the badge will come into its own. After one stop nothing. Despite both me and the woman giving hard Paddington stares at everyone seated. Everyone was either engrossed in a paper or their mobile phone or talking to each other or staring into space. OK onto the next stop, surely by now someone will look up and see her badge, specially as she had now moved into the centre of the aisle between the seats to look more noticeable. Nothing. By now I was beginning to feel awkward & slightly annoyed. I could see her badge from the other end of the carriage. Surely someone should have noticed by now. If I was her I probably would have asked for a seat. But then I thought, why should she? She was wearing a badge that said "Look I'm pregnant, I've gone to the trouble of getting a badge from London Underground and I'd like a seat". Isn't just the fact of wearing the badge enough to save people the embarrassment of asking for a seat and the embarrassment of offering a seat to someone who isn't pregnant? Not in this case. Another stop went by and still no one got up. Finally a lady standing next to me had also had enough. She loudly and politely said "Could one of you give up your seat for this woman, she's pregnant?" Immediately a man who was with a female friend stood up and offered their seat. The pregnant woman said thanks and informed the carriage that she was actually six months pregnant. Shame it took three stops for this to happen. I know that we can all be so involved in our papers, books, kindles or whatever, but it takes close to no time to occasionally look around to see if someone might be in more need of a seat than yourself (pregnant or otherwise). Otherwise TfL can you spend some of your revenue making badges that maybe a bit more in your face? Perhaps we have to get to the level of "Pregnant please let me sit" if "Baby on Board" is too subtle for some! Update - seems a lot of people had never heard of Baby on Board badges until this post - here's information from TfL's site on and how to get hold of one if you're pregnant. The link also includes information on Priority Seating in general. The votes are in and the winners of the latest competition from Weadmire are in. The three T shirt designs inspired by your suggestions will be made into real T shirts which be on sale in their Shoreditch shop and online soon. Congratulations to Eric, Mark and Breige and thanks to everyone who voted. A special thanks for Weadmire for once again getting so involved with the competition. 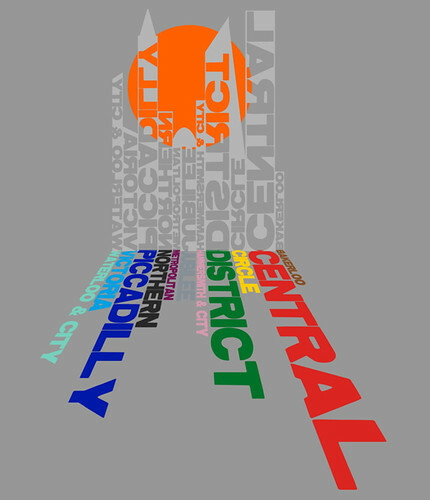 We'll have another one coming up in the future, as one of their designers would like your thoughts on how London Underground trains could be featured on T-Shirts. Also look out for Weadmire on Twitter to keep up to date with their work. 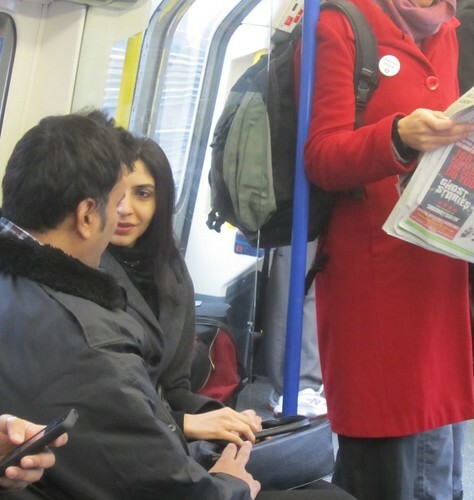 Is the London Underground a life saver? That's certainly the impression TfL are hoping we get from the new Tube Map cover. 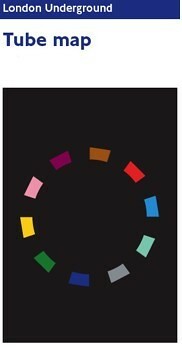 In circulation from March 2011 it's based on a recent sculpture by Eva Rothschild created in 2009 called - Good Times. The ring is made up of Tube line colours with a black background which apparently references "the dominance of darkness as we travel through the tunnels underground." Eva Rothschild explains her thinking behind the artwork: "The spectrum and colours also hold specific meaning of their own, echoing a life belt, for me this reference seemed appropriate because so many of us, including myself, depend on the Tube, its iconic map and London's huge transport system in order to go about our day-to-day lives." TfL said "The ring or belt form implies linkage, which can be interpreted into what the Tube essentially does for London. Rothschild is particularly interested in the way objects have a power over us, especially in relation to religious thought and superstition." I can understand this. 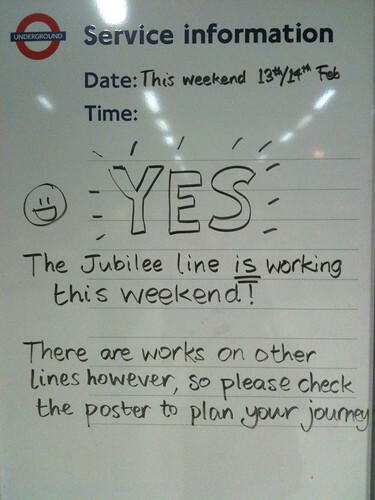 Many of us thank God whenever we don't have to use the Tube or harbour superstitious thoughts about the Jubilee Line only having weekend engineering works when there's a vowel in the month. 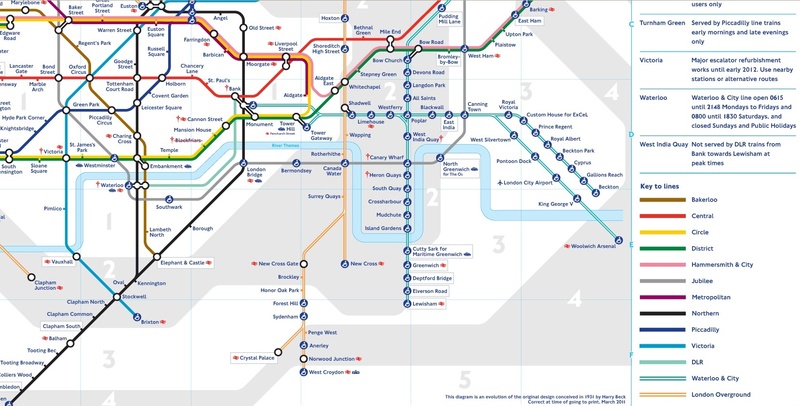 Regardless of whether you see the Tube as a life saver or a collection of bright lights in a dark tunnel or a place for "Good Times", you'll be able to pick up the new map in stations from next month. On Tuesday 1st March London Transport Museum will be hosting a talk on London Underground's poster campaign during the Second World War. 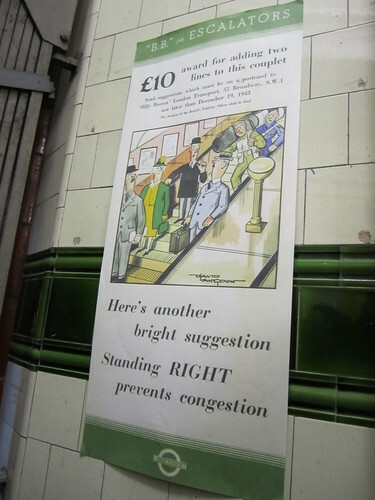 As well as conveying essential information to staff & passengers, the posters tried to encourage thoughtful behaviour. Much of this was done through the humorous cartoons of Fougasse and David Langdon. You might have seen the Billy Brown "the London Underground's most exemplary passenger" campaign, whose rather po-faced, 'do-gooder' advice was often spoofed. For example, the common response to his "I trust you'll pardon my correction, that stuff is there for your protection" was "We thank you for your information, We're trying to see the bloody station". 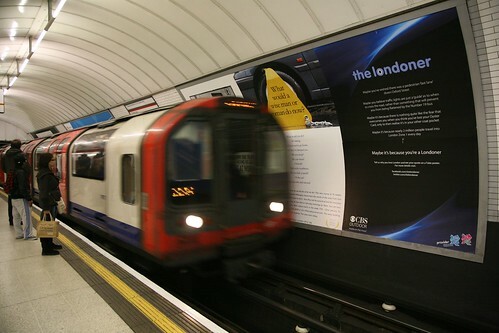 London Transport thought if you can't beat them, join them and set up competitions for travellers to design their own rhyming couplets for Brown. More direct appeals for co-operation, or advice on sheltering and the 'blackout' were expressed in easy to read layouts, perhaps wisely, without the use of humour. 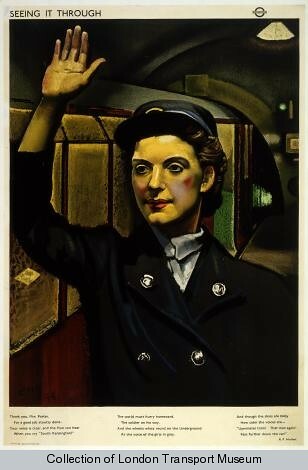 Other posters celebrated London Transport's contribution to the war effort and London's resilience. Seeing it Through was a series of posters (see above) commissioned from Eric Henri Kennington by London Transport in 1944; they commemorated the everyday acts of heroism by civilian workers during the Second World War. London Transport Museum's Head Curator David Bownes and art historian Jonathan Black, will cover the orgins of the posters from morale boosting propaganda to visions of post war society. The talk starts at 6.30pm at London Transport Museum in Covent Garden. Tickets are £8 for Adults; £6 for senior citizens and £4 for students. Telephone 020 7565 7298 to book your tickets. 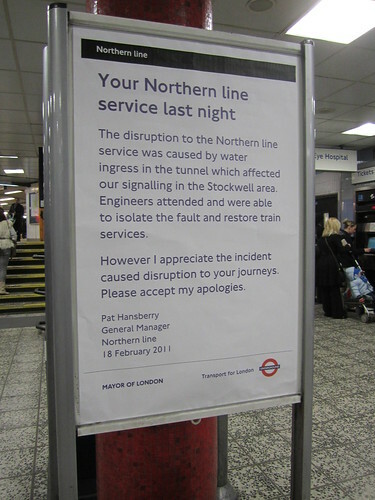 Last night's Northern Line delays were caused by "water ingress in the tunnel". Luckily it doesn't sound like some sort of dramatic flooding, but I wonder how many people were told that the delays and part suspension were due to "water on the line"? There was much grumbling on Twitter as the ubiquitous "signal failure" was the blame for the delays. Tube drivers themselves (as is usually the case) didn't know what was causing the problem. I know it doesn't help speed up our journey, but I certainly prefer to know what's causing the problem. It helps people appreciate the frustrations of staff more and also helps me guestimate whether I should make an alternative route (if I'm not already stuck on the line). Thanks to the major grumblings on Twitter & a TfL email alert I decided to avoid the Northern Line. So I went home using the Waterloo & City Line & South West Trains from Waterloo (the District Line also had problems). It was interesting to see screens at Waterloo station advising the weekend's engineering works, accompanied by pictures of guys working on the tracks. Real photographs and not those standard cartoons. 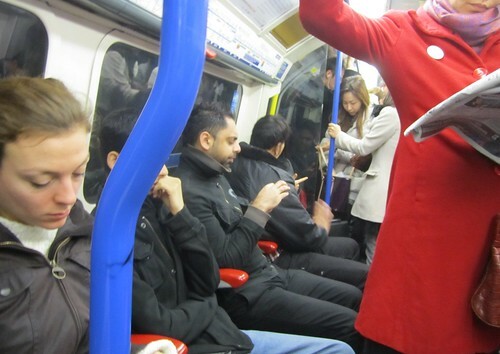 Which reminded me of Tube boss Peter Hendy's promise that we would see more of this on the London Underground. So where is it now though? It's great to have an apology & an explanation of problems after the event, but why does it take so long for the reason behind line failures to get to staff & us poor travellers who use the service? 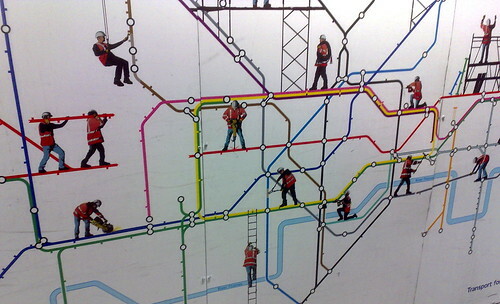 What do you think of London Underground apologies? Do you think more could be done to keep us informed? How & where would you like to see LU explain themselves? Tube vs Foot - who will win? This morning sees another of the experiments to "race against the London Underground". Over the years running, cycling even walking have all been pitted against travelling on the Tube. The latest is a challenge by Stephen Wright who's going to see if he can run 17 routes faster than Sophie from Quonospotter can travel the same routes by Tube (see Stephen's blog for the route). 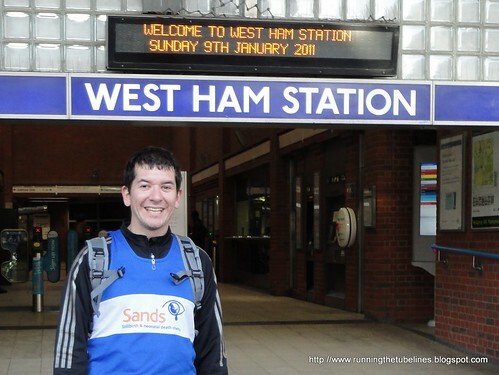 Stephen's doing this as part of a 400 mile challenge to run between every point on the Tube network within 9 months. It's to help to raise money and awareness for stillbirth and neonatal death charity SANDS after his wife suffered a late miscarriage and lost twins. - For the smaller stations, the distance from ticket hall to platform is inconsequential. - The route is serviced by at least two lines: Hammersmith & City and the Circle. 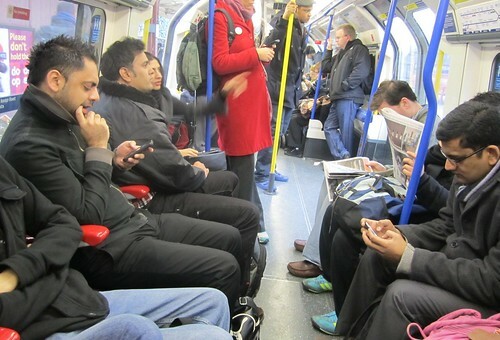 - Er, actually there aren't many advantages for the Tube Runner! Many comments have been along the lines of the runner being a dead certainty to beat the Tube every time.... If that's the case, then why do people use this Tube line at all? With an aging infrastructure and many extended delays, you have to ask why people volunteer to descend underground to travel in such cramped conditions when equivalent passage by foot might be more pleasant?" Why indeed? Obviously not everyone is able to run or even walk their whole Tube journey to and from work. But challenges like this certainly make you think of the benefits of getting off a stop earlier than usual or at least not making Tube journeys for "short hop" trips where it is often "quicker to walk". You can follow Stephen and Sophie's progress on Twitter where they'll be using the hashtag #rttl to give updates of their journey. They are setting off at 9.30am. May the best foot or rail win! 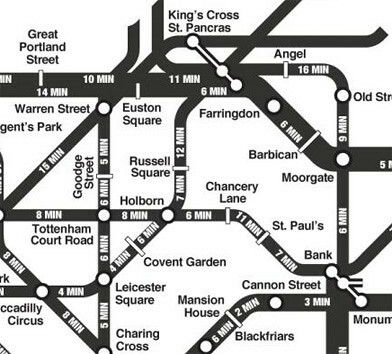 Alphabetical Tube Challenge - Also a longer Tube challenge will be taking place today - Ian Jones is going visit in order, a London Underground station for each letter of the alphabet! He said "The challenge should be manageable in one day. I did consider attempting a stricter mission, involving visiting, in order, the first A of all the As, the first B of all the Bs and so on. This, however, would have required me to cross the entire Underground network from one end to the other several times in a row (Dagenham East to Ealing Broadway to Fairlop, for example) and taken at least 16 hours." Regular readers of the blog will know that I love hearing stories about London Underground staff showing their human side. I suppose I should qualify that by saying "positive" human side. Anything that helps to cheer us up on the Tube goes a long way and it's often the smallest things, that make the most difference. 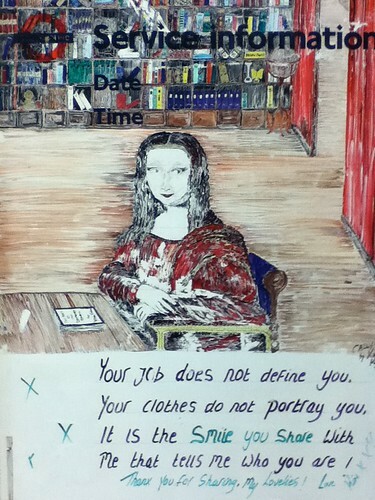 Yesterday I found a lovely picture by Caledonian Road Tube artist Kim. She's a great artist & obviously it's no mean feat to draw pictures on "service announcement" boards, but I love the little touches where she calls people "My Lovelies" (Incidentally - the boards are used for real service information too, apparently they cover up the drawings with a large sheet of paper when they need to make them)! "There's a driver on the Waterloo and City line in the evenings who must be the most friendly driver on the entire Underground. I'm sure he would give the Warwick Avenue guy a run for his money. When you get on at Bank he welcomes everyone aboard then (after a long queue to get onto the train) asks everyone to cheer up, sit back, relax and enjoy the ride. "Waterloo folks, we are approaching Waterloo. Please take all your belongings with you when you leave the train. Kindly take all your belongings with you when you leave the train. And whatever you do, wherever you are, whatever the weather, have a lovely evening. God bless and take care. This is Waterloo." In your travels, if you've come across a Kim, Mr Warwick Avenue (aka Tim Pinn) or cheerful station assistant or driver (or anyone else working for TfL who makes you smile), I'd love to hear about them. There's a number of people who are getting miffed about fines for not touching in or out at barriers with their Oyster cards. The maximum amount for not touching in & out increased to £6.50 last month, up more than 8 per cent from last year. Now a group of commuters are campaigning about being fined particularly on the Docklands Light Railway, where there are fewer actual barriers than on the London Underground. Richard Griffiths, head of strategic media at a PR agency said "What’s happening is that the DLR owners SERCO are cracking down on people who board the train with valid Oyster cards but who fail to swipe when they board the train. The problem is there are no barriers on the DLR and the swipe points are often hard to find. That means irregular users like us are being caught unawares." After himself and a colleague received an on the spot penalty fine of £25, he's set up a Facebook group "Stop the DLR Penalty Fines Rip Off" which he urges people to join and also to appeal against the fines. Why doesn't the DLR install more barriers or are they happy getting more income from fining people? The train companies have said they would only install more gates at smaller London stations if these “represented value for money”. In the 11 months to November 2010, people failed to touch in or out at the start or end of a journey 13.2 million times. The penalty charges for the period came to a total of £56.9 million. Compare that to only £32 million in 2008. Are people really being almost doubly dishonest or forgetful or is the lack of barriers or broken & open barriers causing this increase? "The number of fines issued on the DLR have increased from approx 15,000 in 2007 to approx 17,500pa in 2010 but – and it’s a big “but” – the number of passenger has also increased from 65m to 75m. So fines have increased but only in line with passenger numbers. These fines are also not pure profit as there are substantial costs involved in mounting ticket inspection operations. If you forget to swipe you get charged the maximum fare wherever you are on the TfL network; if you a fare evader you are denying London's transport network money and will be charged £50 (or £25 if you pay within 21 days) also wherever you are on the TfL network – the DLR does not have a different policy to any other mode. The DLR has one of the lowest levels of fare evasion on any railway in the world – approximately 3% - and TfL does all it can to encourage passengers to always touch in and touch out with signs, posters and PA announcements. TfL recently spent £1m increasing the numbers of Oyster card readers on the DLR network by 105 to 240. The readers are sited at DLR entry points such as escalators and ticket machines as well as on platforms and they are almost always accompanied by eye level signs alerting people to their presence. There are also passenger service agents on every train who can issue tickets on the spot if passengers ask for them. Finally, there is also an appeal procedure if passengers feel they have been unfairly issued with a fine. So with all these avenues available to pay for your journey, I believe our passengers get a lot of opportunities to do the right thing. Incidentally, on the matter of barriers or gating stations – our passengers tell us in surveys they like the ungated and open nature of DLR stations. It’s also worth considering that with an already very low rate of fare evasion it does not make good business sense to go to the cost of installing barriers/gates and also employing extra staff to monitor them." If you see people itching on your journey, chances are they read yesterday's Evening Standard about the possibility of bedbugs on London Underground seats. Apparently there was a "bedbug pandemic" in New York last September, which led the Standard to track down a dog, (her name is Lola), who seeks out bedbugs in hotels in the UK. 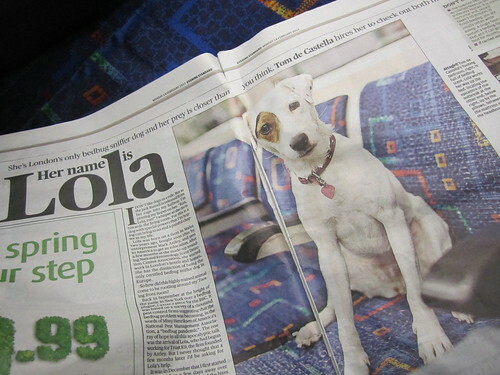 The reporter (who had bedbugs in his Tooting flat) sent Lola on a Tube journey to sniff out the carriages. A senior figure in the pest control industry, who didn't wish to be named, said that the Tube was a home for bedbugs. He said: "I'm aware of the Northern line having a problem but it's not just one line, it's the Piccadilly line, Central line and others as well. Just as with the outbreak in New York, anywhere like the Tube could transfer bedbugs on to people"
You'll be pleased to hear that Lola didn't conclusively track down any bugs on her journey on the Northern Line. Clive Boase who runs the Pest Management Consultancy, urged people not to overreact and said "I'm not saying there aren't any bedbugs on the Tube but it's far from common." Although bedbugs.co.uk claims public transport is a "potential source" and in the "Control Steps needed" for minimising the risk on public transport, it helpfully advises in its development protocol: "Do not sit down. Stand or get a shooting stick." Fortunately the reporter, doesn't seem to think we should get in an order of shooting sticks for our Tube commutes anytime soon. Apparently, TfL have been "made aware of specific outbreaks but had failed to give complainants evidence that it had taken action to resolve the problem". 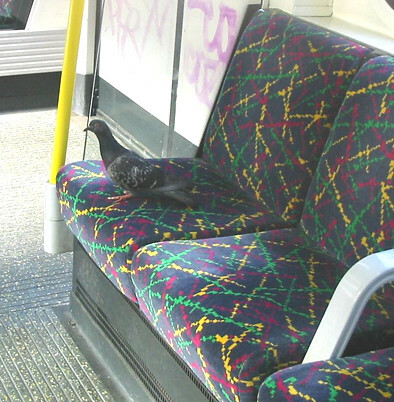 Look out for a report on bird flu from Tube Seats!! This all reminds me of the time when a spokesperson from TfL was interviewed on LBC radio in 2002, countering an urban myth & emails making the rounds about what scientists had supposedly found on Tube seats on the Central Line. 1 previously unheard of fungus"
The spokesperson said "It is false. We followed that through and it's entirely fictitious, and as I said, in fact, when it comes to cleanliness, we’ve actually seen a 4 point improvement in the last year, and there's no truth at all in those suggestions." Let's hope Bob Crow doesn't use the Standard article as a reason to call a Tube strike to protect his members from bites. 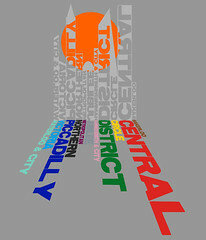 Many of you entered the competition to win a London Underground themed T Shirt from Weadmire. The Shoreditch based company were so inspired by your suggestions as to what you'd like to see on a T Shirt, they've mocked up their favourites & now three will be made into real T shirts. But they need your help to vote for the ones you'd like to see in their shop. You have until Sunday 20th February 23.59pm (UK time) to vote for your favourite. The lucky people who inspired the three winning designs will win their own T shirt. So good luck to Eric, Mark, Darin, Matthias, Briege & Joe. Don't forget to encourage your friends to vote for you! Thanks again to Weadmire for getting so involved with the competition - they're on Twitter if you want to follow them. I'm really looking forward to seeing the winning designs and will see if I can get some for another competition in the future. The guys responsible for selling ads on the London Underground, CBS Outdoor, are running a campaign about why people love London. If you want a chance of seeing your name & quote splashed across the Tube, visit their Facebook Page, & tell them why you love the city. Some of the best entries will be featured on their digital formats & website next week, and the printed posters will be up on the system from the end of March. Stephen Fry eloquently said: "You can have your brilliance memorialised on a Tube poster". It looks pretty simple to enter the only condition is that it needs to suitable for all ages (you know how CBS are about approving Tube ads - or not)! 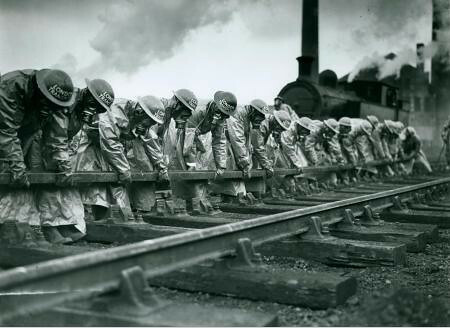 On Tuesday 15th February 2011, Oliver Green will be giving an illustrated talk about London's transport during the Blitz. For those who missed or enjoyed the excellent Aldwych Blitz Tube tour, this will be an interesting evening. During the main Blitz from September 1940 to May 1941, London was bombed nearly every night, yet trains and buses still ran every day. The deep London Underground stations became overnight air raid shelters for thousands of Londoners, but were always ready the next morning to carry commuters who were determined to get to work. 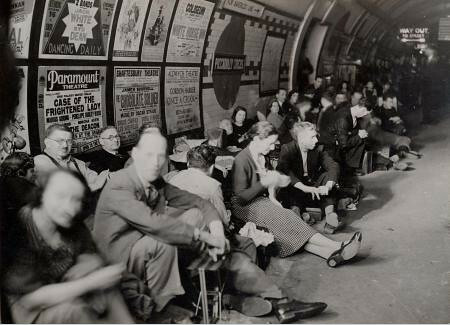 Air raid shelterers on a platform at Piccadilly Circus Underground station - September 1940 - London Transport MuseumUsing photographs & film extracts, Green will show how ordinary Londoners lived and worked. You'll learn how London Transport's workshops built bombers instead of buses, and how staff struggled to maintain and operate a badly damaged system in difficult and dangerous conditions. Oliver said "I’ll be showing one of the most famous examples of wartime propaganda film with my talk. It’s a brilliant ten minute documentary called London Can Take It made in October 1940 at the height of the Blitz by the GPO Film Unit, directed by Humphrey Jennings and Harry Watt. It was shown in cinemas all over the country before the main feature and also in US cinemas as part of the drive to get America into the war against Nazi Germany. The voiceover is by an American journalist, Quentin Reynolds, and takes the form of a news report." The talk starts at 6.30pm at London Transport Museum in Covent Garden. Tickets are £8 for Adults; £6 for senior citizens and £4 for students £4.00. Telephone 020 7565 7298 to book your tickets. The Grand Entrance Hall at the Brunel Museum has been unused and inaccessible for 140 years, but this weekend & on Valentine's Day, Museum Director, Robert Hulse is presenting an unusual tour based around love stories relating to the history of the chamber. 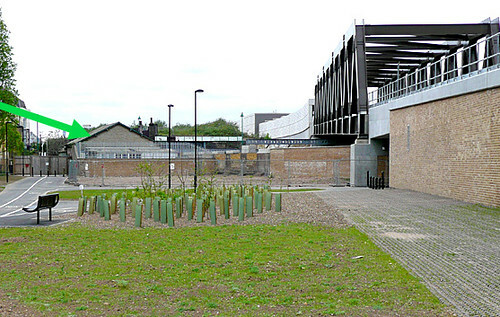 "The Rotherhithe columns are mounted with burgeoning green shoots of the angiosperm acanthus. Thousands of lovers have rushed between these two elegant talisman. Stroke or caress the pillars, trace with your finger the orange ring of the East London Railway or press your cheek against their cool firm glory. "Take your partner’s hand, look into their eyes and say together: ‘I plight you my troth, with open heart and open mouth, standing at the foot of Frenchman Brunel’s Wapping Shaft’. The Lovers’ Lift will take you back to the real world. 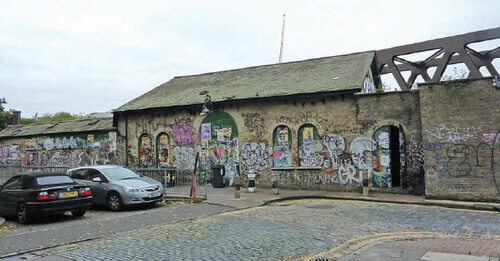 Take a look at Wapping, but even if you plan to return directly to Rotherhithe, remember your Oyster. To avoid a penalty fare, ‘Pay as you go’ should exit Wapping and come straight in again. Give your Oyster a stroke, and don’t forget the Tunneller in your Life." 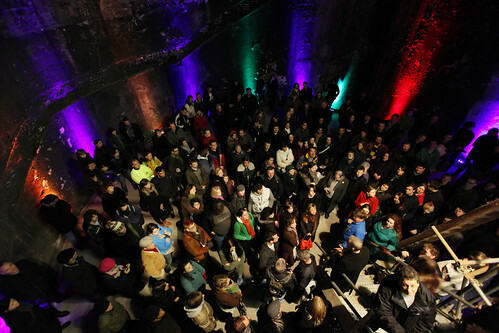 Tickets are £5 include admission to the Museum of Tunnelling aka the Brunel Museum. No need to book, just turn up & enjoy. 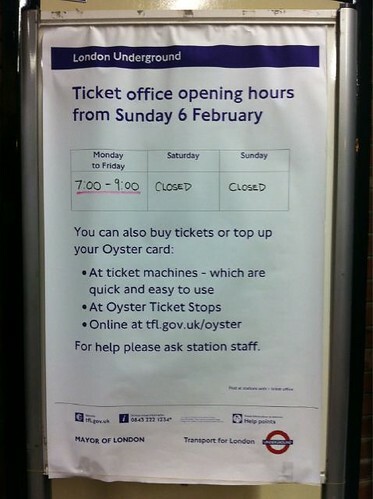 From Sunday 6th February 2011, if you want to buy a ticket or top up your Oyster card from a real person, you'd better check the new London Underground ticket office opening hours. London Underground say the changes are to put staff on the frontline & in areas where they will offer "the best possible service to passengers." LU have said "there will always be staff present at every station to help passengers" and there "will continue to be a ticket office service at every station that had one previously". As you probably know, the reduction of staff at ticket offices is one of the issues at the heart of Tube union & LU disputes about cutbacks and led to a number of Tube strikes last year. Gerry Doherty of the TSSA union has already accused Boris Johnson of "jumping the gun" with the new ticket office hours, as talks with ACAS about the safety implications of behind this are still continuing. "The Mayor cannot wash his hands of the on-going crisis on the Tube that has developed on his watch. 1000 days into his leadership of this City he has failed to have a single meeting with the Tube unions and instead of resorting to puffing up ludicrous suggestions like driverless operation he should be talking to the people at the sharp end who know what’s going on. "Boris Johnson opposed the cuts to ticket offices before the Mayoral election because he knew that was what the voters wanted. Nothing has changed since then and there is absolutely no excuse for him to sit back and watch while the Tube system is turned into the playground for thugs and vandals that has been so graphically exposed in recent weeks". My local station has exactly the same staffing hours, so I won't see a difference, but I'd be keen to know whether your local station's ticket office will have reduced hours and whether you're bothered by it. Do you feel reassured knowing there is someone in a ticket office in the evenings? Does the presence of staff in ticket office put off 'thugs & vandals'? Do you think station staff are equipped to deal with criminals at platform level? If you were travelling on the Jubilee Line yesterday and thought some of driver's announcements sounded a little ... err ... posher than usual, you would have been listening to Boris Johnson. Boris was in a London Underground train operator cab to see the new signalling in action. 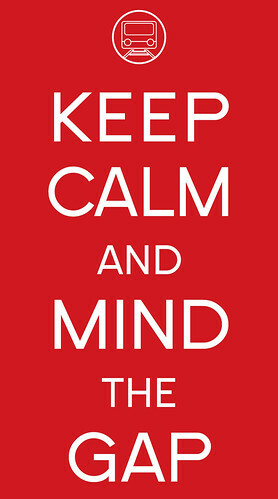 He said on Twitter "Rode in the driver's cab on the Jubilee this afternoon. It was fab. Amazing in fact. I have seen the future! So much easier for the driver!" Jubilee Line drivers' cabs always seem to get VIP's! The new track and signalling has been the bane of Jubilee passengers lives for the past year or so, with almost weekly weekend engineering work closing a lot of the line. However, it looks like the end is almost in sight as Boris announced "we can now see real milestones being reached, including the long awaited completion of this crucial upgrade in just a few months time." Mike Brown, Managing Director of London Underground, was speaking about Tube upgrades at the London Assembly Transport Committee earlier today. He said "We carried 90.6 million passenger journeys in the four week run up to Christmas, the most we've ever done in our history....... We're very proud of these record numbers but it does indicate that we're stretching our current network and our current technology, and the people who work on the system, to the limit. .......We have to upgrade the Tube in a way that causes the least disruption to passengers while we do." Specifically on the Jubilee Line upgrade he said "We've now introduced the new TBTC automatic signalling operation for most of the line between Stratford & Dollis Hill." Val Shawcross, chair of the committee, tried to pin Mike Brown down to a firm date, as to when the Jubilee Line work would be finished. Obviously not being confident of the "Spring of this year" mentioned in TfL's press release. "What does Spring mean ? Give us a month!" she said. Spring then appeared to move. "I'm absolutely convinced it will be the first half of this year" said Brown! 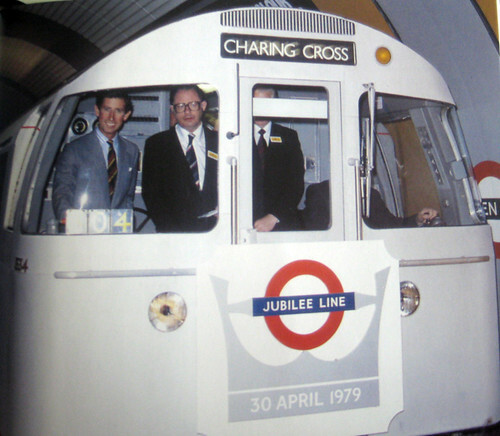 Brown assured the audience that we would not see anything like the amount of closures on other London Underground Lines that have been experienced on the Jubilee Line. "That is something that is unacceptable it is not going to occur with the Northern Line nor with any other line." He said adamantly. If you've got a spare hour or so you can watch a webcast of the full meeting. Brown also discusses upgrades on all other lines (starting at 1 hour 19mins in). Anyone interested in Crossrail can also watch a progress report from Chief Exec Rob Holden, who resigned at the end of last year. 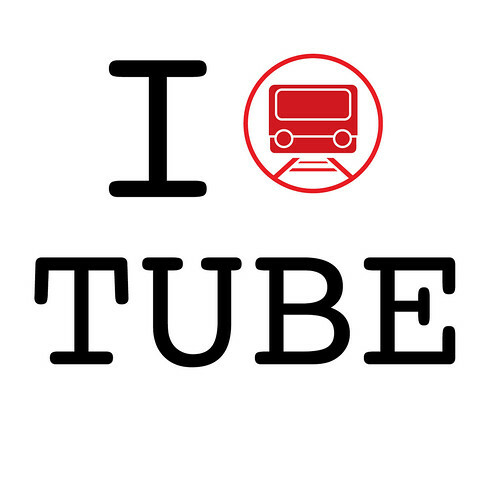 If you don't have an hour to spare London Reconnections have a good post on the meeting including the full & summary response Mike Brown gave when asked about driverless Tube trains! Hat tip to Tom Edwards the BBC London Transport correspondent who was at the meeting. UPDATE - 4th February 2011 - Apparently Boris Johnson was "snapping and shouting" at senior TfL figures, after a broken down train on the Jubilee Line, caused severe delays this morning. Not the best timing after his "we're making great progress on the Jubilee line speech above." The train broke down just after 7.30am, blocking the line at North Greenwich and preventing trains turning round at Stratford. Trains were suspended between Canary Wharf and Stratford throughout the morning peak. More from The Evening Standard. For the first time in my memory at least, TfL will be automatically giving a refund to people for the disruption caused. Mike Brown, MD of the London Underground said: 'I am very sorry for the disruption suffered by our customers on the Jubilee line this morning. For those on the east end of the line this was compounded by problems on the DLR and I know it meant a tough journey to work for many. 'As a result we will be refunding those passengers the cost of their travel today." for more details and to see if you qualify visit this page on TfL's site. Clint Eastwood's latest film, Hereafter, which hits our cinema screens this weekend used the London Underground for scenes on the 2005 London bombings. The disused Jubilee Line platform at Charing Cross Tube and the outside of Liverpool Street station were filmed to recreate the attacks. The location manager, Martin Joy, was delighted with the results and said to LU's Film Office. "Clint and the producers were very complimentary about everyone, particularly your duty managers who were brilliant on the day." However, the film seems to have got a ribbing by most UK critics ('transparent hokum' - The Indie ; 'unlikely exercise' - The Guardian). Metro said there was "a nagging sense that real-world tragedies – including a weird misappropriation of the 7/7 bombings – have been shoehorned in to lend dramatic impetus to a flimsy and vapid premise." The Scotsman echoed this and said the film "brazenly exploits horrific memories of the 2004 tsunami, and the 2007(sic) terrorist attacks on the London Underground, for the sake of pepping up the film's conspicuous lack of drama". British scriptwriter Peter Morgan was in London at the time of Tube and bus attacks. He noticed an awareness of mortality in faces of people around him. He felt it was something that we usually keep hidden and wanted to explore this in the film. He told the BBC that his intention wasn't to "exploit" the events but to reflect a world in which "the threat of death is ever present". "We are living at a time where attacks are random and sudden and have no boundaries and explanation. I wanted to write something that meant I could come to grips with the fact death was something I had to live with on a daily basis." The timing of the film's release coming shortly after the inquests of the attacks probably hasn't helped the "insensitivity" claims. However, it could be argued that there's never a good time to make a fictional film about the attacks. Although using comedy is one way around this - as critics favourite Four Lions showed. Also last year's London River, about the aftermath of the attacks was called a "thoughtful, resonant meditation on 7/7" by The Guardian. If you see Hereafter this weekend let us know what you think. In the meantime spot the Tube shots towards the end of the trailer above. Wonder if Eastwood actually travelled on the Tube while he was in London to get a feel for the real location? 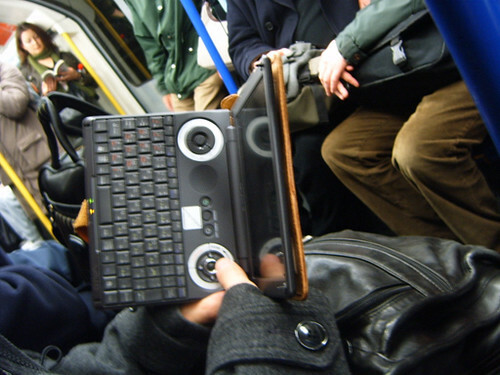 I remember the days when e-readers were extremely few and far between on the London Underground. Now Kindles are pretty common place. 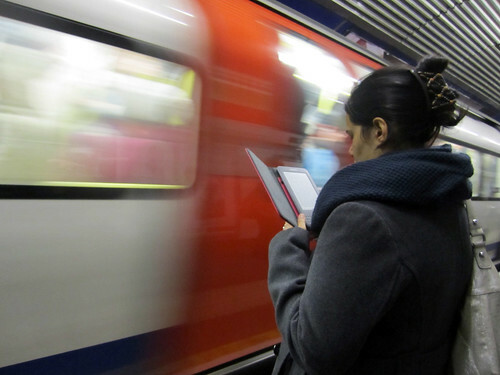 Just within six months, even seeing someone reading an iPad on the Tube has lost its novelty value. "It's a Kindle", she replied. "Ah", The penny dropped and they carried on chatting to each other. I remember feeling like the kids when I saw this chunky looking e-reader above five years ago. I had no idea what it was at the time. e-readers have certainly come on leaps and bounds since then. 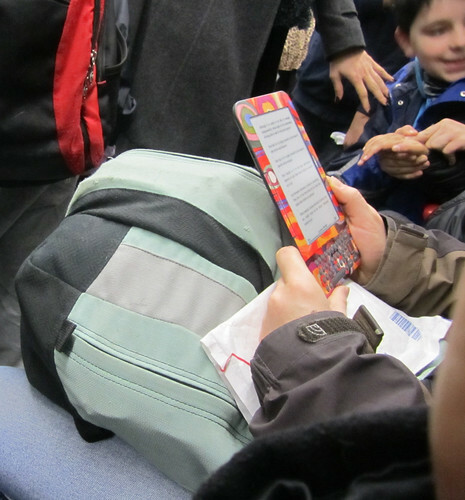 However, I wonder if in ten or even five years time we'll see more people reading from iPads, Kindles or other e-readers than we see people reading printed books and papers on the Tube? Are people worried about getting these devices out for fear of getting them nicked? Is it all just a question of cost (even though a Kindle costs about the same price as an iPod), are they still too expensive? Is it still more comforting to handle physical paper & newsprint on a Tube journey?